Better World Books tapped a student group from Emory’s Goizueta Business School to determine a location for this giveaway with the greatest impact potential – targeting areas with reading and literacy needs, as well as lower-income families with school-aged children. The group chose the Atlanta University Corridor (AUC), and solicited KIPP STRIVE Academy to serve as the event partner based on similar missions to educate and empower communities with little access to educational material. Book for Book™ by Better World Books from Better World Books on Vimeo. *Parking available in the lot surrounding the campus. Better World Books (www.BetterWorldBooks.com) is a for-profit social enterprise that collects and sells books online matching each purchase with a donation, book for book, and with each sale generating funds for literacy initiatives in the U.S. and around the world. With more than eight million new and used titles in stock, Better World Books is a self-sustaining company that balances the social, economic and environmental values of its stakeholders. 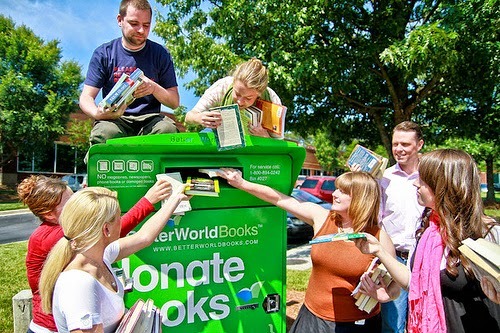 Better World Books diverts books from landfills by conducting book drives on thousands of college campuses and libraries. Since its founding in 2003, the Mishawaka, Ind.-based company has raised over $16 million for libraries and literacy, donated over 12 million books; re-used or recycled over 120 million books and achieved 44,000 tons of carbon offsets through carbon balanced shipping. KIPP STRIVE Academy, located in the West End/Westview neighborhood in Atlanta, is part of KIPP Metro Atlanta Schools, a network of free, open-enrollment, college-preparatory schools dedicated to preparing students in underserved communities for success in college and life. KIPP Metro Atlanta Schools operates seven schools including two elementary, four middle schools, one high school, and the KIPP Through College program which supports students on their journey to and through college. KIPP Metro Atlanta plans to serve more students each year as it grows into a full K-12 network. For more information please visit our website at www.kippmetroatlanta.org.